Despite claiming that Far Cry 5 doesn’t have any political message, Ubisoft has made multiple references to Donald Trump’s controversial Space Force in the game’s upcoming spin-off. Far Cry New Dawn, a post-apocalyptic take on the series’ recent middle-American outing, features an entire weapon line named after the US President’s planned celestial branch of the armed forces. In a preview image captured by GameRevolution, a sniper rifle named the ‘Space Force’ SA-50 can clearly be seen in an in-game menu. The weapon’s caption reads that it is “surely the greatest firearm the world has ever seen. Ever,” apparently aping some of the president’s more hyperbolic language. If you ask me, the very existence of Far Cry 5 is a statement about middle America, and a post-apocalyptic spin-off doesn’t exactly scream apolitical. And that’s before we’ve even got into the setting of The Division 2, the concept of the entire Watch Dogs series, or the fact Far Cry 5 mentions Trump’s pee tapes. Nevertheless, Ubisoft CEO Yves Guillemot says that while the developer is happy to ask political questions, it won’t supply its audience with their answers. 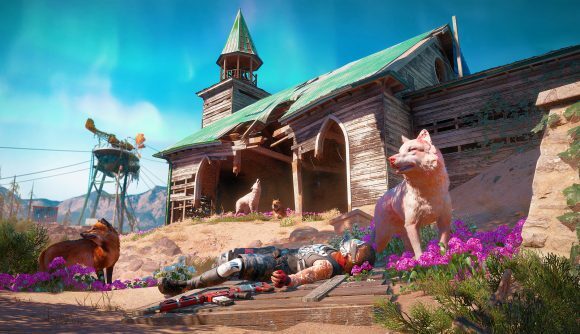 You’ll be able to head to Ubisoft’s take on futuristic Montana very soon, as the Far Cry New Dawn release date is February 15. As for Space Force, Trump has said he wants it in place by the end of 2020, but that assumes the government won’t still be shut down by then.